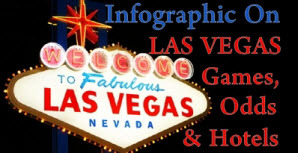 Las Vegas Games, Odds & Hotels - Infographics '+g+"
Las Vegas is known across the world for its crazy city of gambling, neon, and partying. With some of the biggest casinos and hotels in the world, it's no wonder it's a hot-spot for gamblers of all ages and income. Pretty much anyone who visits Vegas will at some point enjoy a gamble - perhaps on the fruit machines, or, more likely, at the thousands of casino game tables dotted around the resorts. With everything from roulette to baccarat available, the action is 24/7 with a vast amount of money changing hands daily. The savvy visitor though wants to maximize their chances of winning, and minimize their chances of losing. So, we've put together this infographic to show you at a glance where the better odds/edges are. In addition, we've listed some facts about the biggest hotels in the world, many of which are in the 'City of Sin'. With staggering numbers of rooms in each, one can only imagine the amount of money these places make!